Students in the Franklin Band program participate in a variety of small chamber ensembles. 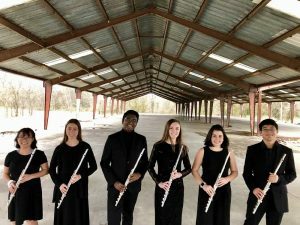 These include flute trios, wind quintets, sax quartets, mixed trios, woodwind and brass choirs, percussion ensembles, etc. These groups allow students to focus on working in smaller teams and provide more individual accountability in music-making decisions as they rehearse the groups themselves. 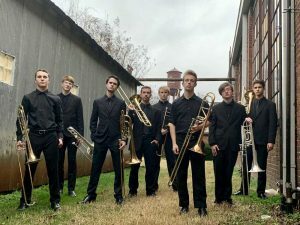 Franklin’s chamber ensembles have been invited on six different occasions to perform at the Music For All National Festival, following a rigorous audition process–Percussion Ensemble (2013 and 2017), Chamber Music Ensemble (2015), Saxophone Quartet (2017), and Flute Choir and Trombone Choir (2019). Want to use our student musicians for an event? Many of our groups have experience and are prepared to play for many different occasions. Contact Jacob Campos for more information.